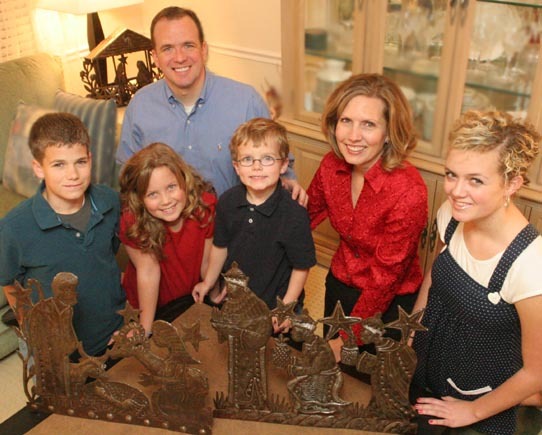 Christmas Gifts of Work: An ordinary family finds a creative way to help less-privileged artisans all over the world. ​Little did Garrick Hyde and his wife, Ginger, realize how their family’s life would change as they watched a KBYU production nearly five years ago. The show, Small Fortunes, described how microcredit can transform lives by lending impoverished people small amounts of money to start businesses. The idea intrigued the Hydes. ​Instead of purchasing single Nativities, the family began buying them in bulk. The idea was to give the artisans more work and then sell the Nativities for a small profit so the family could assist even more impoverished people. At one point Garrick began dreaming about artisans in Mongolia. “I didn’t know anything about Mongolia, but the dreams became insistent.” He wrote a letter that began, “Dear Mission President and Wife of the Mongolian Mission” and mailed it to the LDS Church Office Building. “I had no idea if the letter would even get to Mongolia, but I asked these mission leaders if they knew any artists in Mongolia who needed help.” Not only did the letter arrive, but the Hydes learned the mission president’s wife collected Nativities and had spent two years seeking out Mongolian artisans who could create them. She e-mailed pictures of the Nativities to the Hydes, put them in touch with the artists, and connected them with a returned missionary who could help with communications. The Hydes involve their children as much as possible. “We want our children to realize how blessed we are,” Ginger says. “We all work on the project,” adds Garrick, “but the real hero is our 11-year-old Hannah. She writes a note and draws a picture that accompany every Nativity we sell.” Hannah has now written more than 900 letters, and Garrick notes that many of the recipients, “touched by her kindness,” write back. “We are training 6-year-old Everett, too.” The project is a 20-hour-a-week, year-round effort, which becomes a full-time job during the holiday season. During December they open their home the entire month for people to come and see their Nativities.